I noticed an error in the Oct II, Nov I and Nov II Soviet Turn reports because I inadvertently headed the Soviet front as Voroshilovgrad rather than Voronezh. Note: To avoid congestion the Moscow Soviet units have been removed to the off map display and locations marked with a red star. Supply Terminals show the furthest Rail/Road limit of the Axis supply line. December I ’41 Soviet Turn. The Soviets prepare to turn their localised attacks into a coherent Winter Counter Offensive. Guards and winterized troops in Moscow are replaced with regular troops where possible and reserves start to form behind the front line south of the city. In the meantime the series of local attacks increase in size and ambition and the Axis arrogance and overconfidence is repaid by the Soviets giving the invaders a bloody nose as their forces launch a series of devastating counter attacks on the main line penetrations. Over 70 points of losses are inflicted including four Panzers reduced to cadres and four infantry divisions completely eliminated. Finland: In the North reinforcements arrive to stabilise the line. Further south the main Finnish/German attack force is counterattacked by the 10th mech joined by infantry forces and a HX eliminates the Axis stack. DEC I Soviet Turn: The 10th mech eliminates the Axis thrust. 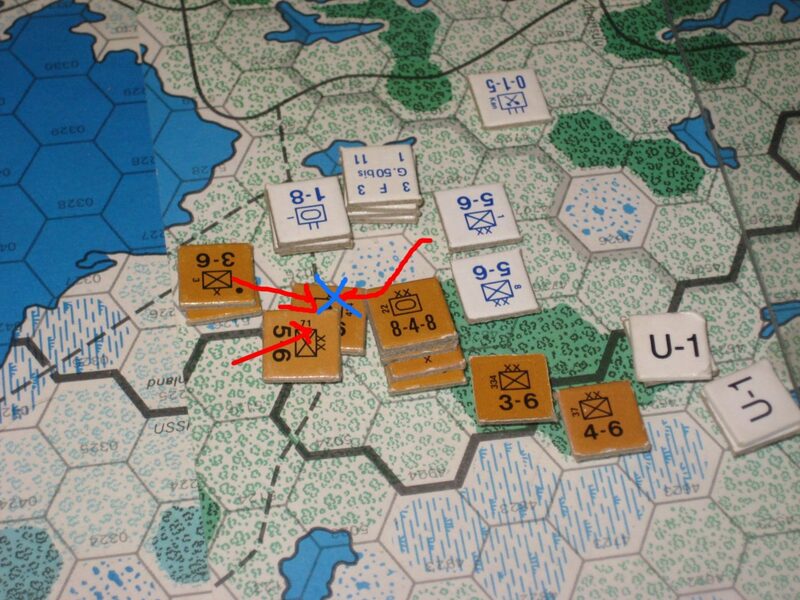 Leningrad Front: On the Leningrad front The Valdai penetration is nipped off and two infantry divisions eliminated in an exchange. Moscow Front: The furthest German penetration is again attacked and this time with more success than a fortnight earlier with a HX reducing a two panzer stack to cadres and eliminating the supporting AA units. Between Moscow and Tula the retreating panzers still just out of supply are reduced to cadres by pursuing Guards, Winterized and regular troops. 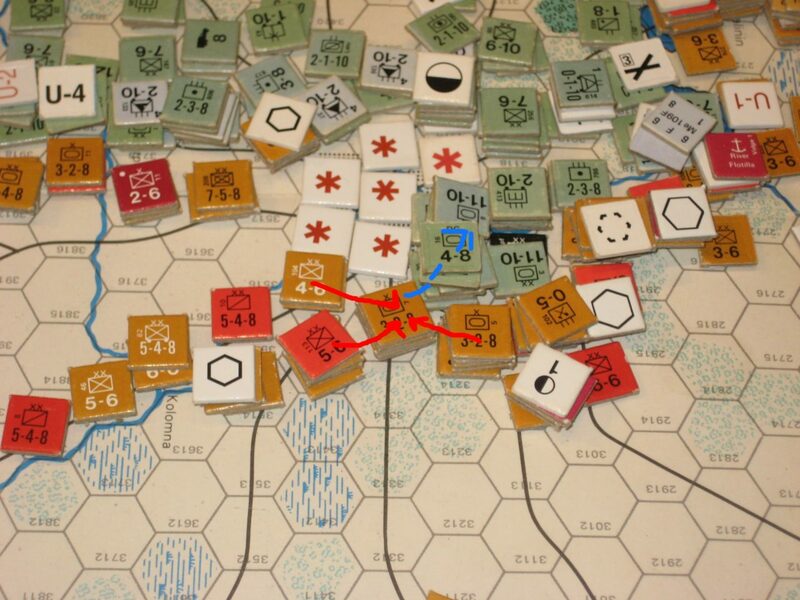 DEC I Soviet Turn: Devastating Soviet attack eliminates southern hook around Moscow. Voronezh Front: The Attack Army continues to move west; one attack falls back in disarray but a second reduces two German infantry divisions to cadres. The exchange however removes a large part of the attack line at the southern tip of the army. Kharkov Front: Very little action is evident as a trickle of in-theatre reinforcements enhance the defence line. The Soviets consider the feasibility of launching a surge to try to relieve Kharkov but the Axis line is now in full supply and there are no spare forces in the south for such an operation. Two unsupplied divisions in the isolated city dice and one succumbs but is replaced from accumulated IRPs. 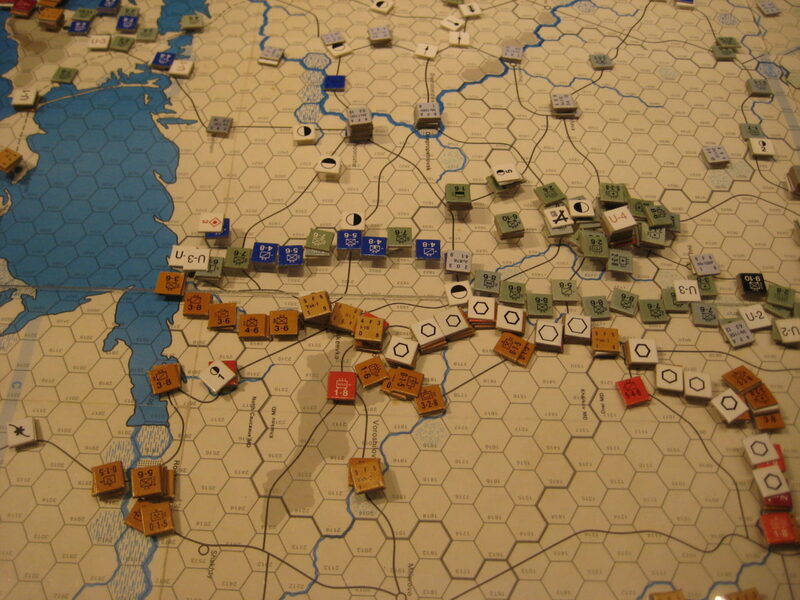 DEC II Soviet Turn: General view of the quiet southern front. Crimea: In the Crimea forces fall back to Sevastopol and the Black Sea fleet splits to cover Odessa and the Fortress. Air War. Short range assault bombers provide defensive support while long range bombers launch a series of deep raids onto Axis air bases. Limited results but two point city fields are neutralized and one fighter from each side eliminated in the execution of the operation. In the south the airlift is continued to provide some supply to the defenders of Kharkov but capacity is limited and two divisions remain unsupplied. German Non-isolated = 66.5. Finnish = 5.